A classic design based on antique Temple necklaces or Haarams. Tiny coins of Lakshmi alternated with ruby coloured spinnel beads with mogra formations depicting fertility of nature . An outstanding Statement necklace. Comes with an adjustable gold colored cord. 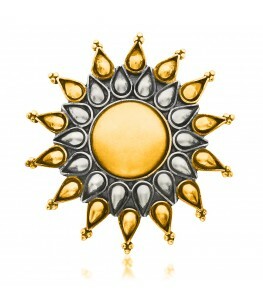 Made in pure Sterling Silver and plated with pure 24 karat Gold.